At a presidential campaign stop in Iowa yesterday, Sen. Elizabeth Warren (D-MA) refused to name a single person she believes would qualify as morally "decent" in President Donald J. Trump's administration. 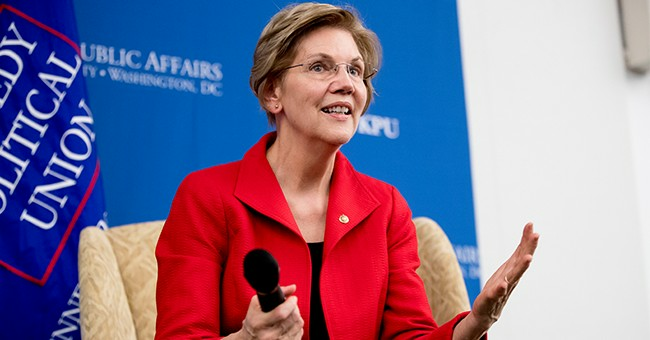 Sen. Warren's comments come after she condemned former Vice President Joe Biden's apparent liberal gaffe that current Vice President Mike Pence is a "decent" man despite his stance on LGBT issues. As noted by Iowa Starting Line, a group covering the Iowa 2020 caucus, members of the press pool asked Sen. Warren for her opinion whether or not Vice President Mike Pence is worthy of the compliment. "You don’t think the Vice President is a decent man?," the reporter followed up. "No," Sen. Warren bluntly said. When pressed if any person working for President Trump deserves any praise for basic human goodness, Sen. Warren was further at a loss for words. "It's a tough question," Sen. Warren began. "The Mueller investigation has already produced 34 indictments or guilty pleas out of people in the President's inner circle. 10 cabinet officials have left, 4 with huge scandals, and others with a threat of scandal at the door. This is the most corrupt administration in living memory. That's why we gotta fight." This brief story drew criticism from former TV star and 2018 NY socialist gubernatorial candidate Cynthia Nixon. ". @JoeBiden you've just called America's most anti-LGBT elected leader 'a decent guy.' Please consider how this falls on the ears of our community," Nixon tweeted. Biden then apologized via Twitter, saying, "You're right, Cynthia. I was making a point in a foreign policy context, that under normal circumstances a Vice President wouldn't be given a silent reaction on the world stage," he said. "But there is nothing decent about being anti-LGBTQ rights, and that includes the Vice President." Now it appears the new litmus test for 2020 Democrats is whether they believe Vice President Pence or any member of the Trump team is a "decent" human being.